The title of our gym class: "Yoga you can do." I tried it with the instructor, Lisette, and found it to be true! As a newbie to this alternative health therapy, I found I could in fact do this style of yoga. Lisette's mantra is "No pain=more gain." So, don't be discouraged by looking at magazines showing these awe-inspiring--and painful-looking--poses. Young people with their legs wrapped around their hips. Or, flexible folks with the back of their neck on the floor, their hips over their heads, and their feet laying on the floor above their head. Yipes! That's NOT the way I do it. I'm more toward the gentler end of the spectrum--mild stretching and deep, slow breathing. The result: management of my chronic low back pain! Would you believe that one major cause of such pain is tight leg muscles? So, now I keep these large muscles relaxed through these exercise classes, and "Goodbye" tight and aching low back. How's that for holistic health remedies that work? To try, reflect on your individual habits and style. Some people work best in groups. Try this to find a local class, often for little to no fee: www.communityactivities.com. "Final Relaxation pose"--also known as "corpse pose"--ends each session; lie completely flat, or with rolled towel beneath knees, and consciously release the tension from each body part. This is extremely important to the yoga exercise session, so don't leave early, if at all possible. breathe into your joints: an essential part of the yoga practice; slow, relaxed, full breaths "into the places where you are tight" as Lisette would say. One literally creates space between the spinal vertabrae with yogic breathing. props: towels, pads, blocks, belts, pillows... for resistance, balance or comfort, these are used to help with getting into the pose and keep you there. Iyengar emphasizes proper alignment, leading to better balance and less stress on the muscles. Holding poses with props is common. Proper alignment improves circulation, creates inner space (literally in the joints), and brings a balanced flow of energy through the whole body. Hatha is physically demanding series of stretching, strengthening and breathing exercises. Bikram or, hot yoga, is done at room temperature over 100 degrees Fahrenheit, if possible. Expect to sweat profusely. Bring your own towel! Ananda gently soothes with mantras, or specific sayings, combined with poses. Ashtanga a more advanced form--used to build strength and stamina. To skip from Yoga to the Therapy to Benefits page, click here. As alternative health therapies go, this yoga field is wide open. On the spectrum of yogic practice, the bare minimum will be breathing and stretching your muscles as you move in and out of the poses. 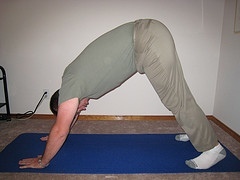 (See the average Joe pictured to the right; he's just showing "Downward Dog" in his work clothes. Hope this encourages you to try!) Simply wade, if that gives you all the benefits you want. ...buy a video for home use, own your own mat, read magazines, study with famous teachers, etc. I enjoyed looking at pictures of the studio in Abbotsford. ...or Dive! There's a philosophical--thinking--part to explore. Even a lifestyle that can grown out of the practice itself. Just grab a magazine and you won't have to look far! This serious and involved end of the spectrum is not for everyone; but it's there for those who want it.